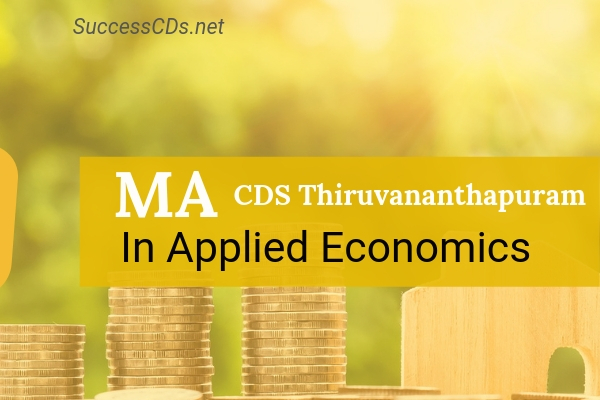 Centre for Development Studies MA in Applied Economics Admission 2019 - Centre for Development Studies (CDS), Thiruvananthapuram, Kerala invites applications for M.A. Program in Applied Economics for academic year 2019-20. Admission is open to Indian nationals as well as students from SAARC countries. The degree is awarded by Jawaharlal Nehru University, New Delhi. Interested candidates can read this notification regarding the CDS MA Economics Admission 2019 from below. MA (Applied Economics) at CDS is a unique program that aims at providing rigorous training in theory, tools and methods for applied economic analysis, with a special focus on issues of economic development. The degree is awarded by Jawaharlal Nehru University, New Delhi. 20 seats are available for students from India and 05 seats are for students from SAARC countries. This prospectus provides details about the admission to the program.